Image Courtesy of T.C.T MEDIA GROUP PUBLICATIONS, GREECE. All rights reserved. Yatzer has the honor of sharing with his readers a residence that is the «TALK OF THE TOWN" at this moment. 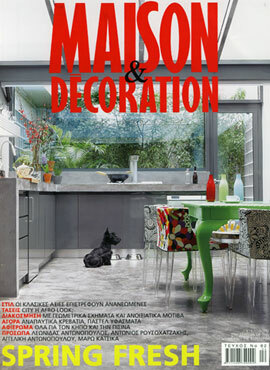 It was firstly published on Sunday the 23rd of March in one of the best Greek Interior design magazines out there at the moment MAISON & DECORATION. Since its publication two weeks ago no one can stop talking about this space. At this point I would like to take a minute and thank the people who made this possible. Firstly the owner of the house, Mr.Andreas Manolioudakis for allowing this to be achieved. Then the Director of MAISON & DECORATION magazine, Mrs. Agapi Tsakpinoglou, who is also responsible for the glorious styling of the shoot and finally the much talented Mr. Pavlos Tsokounoglou for his great pictures. Thank you for sharing this with the Yatzer readers. 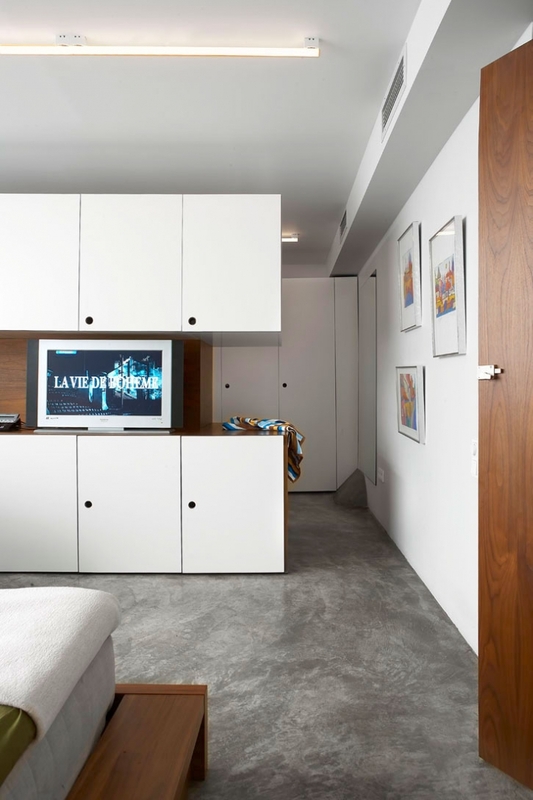 It defies belief how this former underground garage has been transformed into a bright home. Kyriakos Katsaros, an ingenious young architect based in London and Andreas Manioloudakis, the imaginative and creative owner, together, achieved the impossible. With the insertion of a glass butterfly roof, they transformed part of the internal courtyard of the family block of flats into an atrium, which now houses Manolioudakis’ kitchen, letting in abundant daylight into the open-plan living areas. However, a section of the courtyard was reserved for a small outdoor garden thus blurring the boundary between inside and out. Also, the entire above-ground section of the front elevation, where the old garage entrance used to be, is now covered in glass bricks in order to let light into the bedroom. 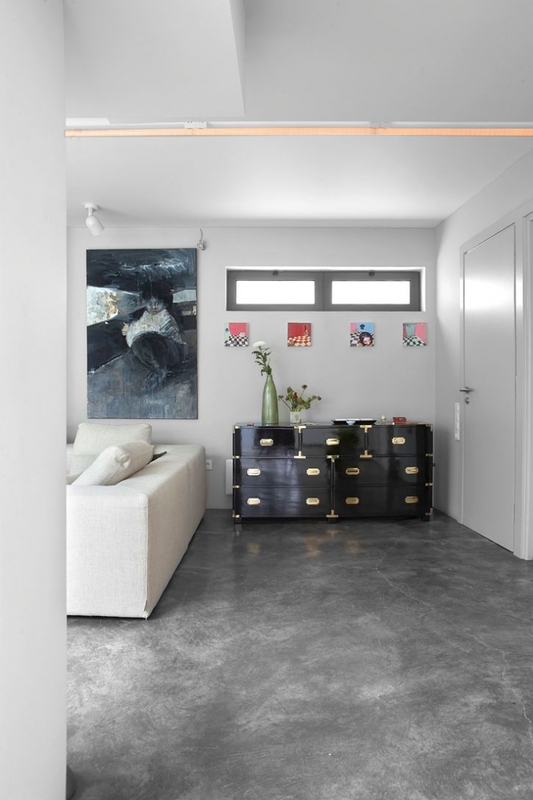 But before any of the above could happen the floor level had to be lowered by 40 centimetres to make this former basement habitable..
Aside from any technical considerations, architect and owner, old childhood friends, spent hours discussing the realities of everyday life in this 160 square metre home so that all spaces could be designed to reflect Manolioudakis’ lifestyle. A sworn bachelor living in the company of his Scottish terrier, Manolioudakis needed only one bedroom; but it’s turned out to be an extremely large one. At 60 square metres, it is almost a self-contained flat, where he can retreat at will. It includes a study, a walk-in wardrobe and an en-suite bathroom. 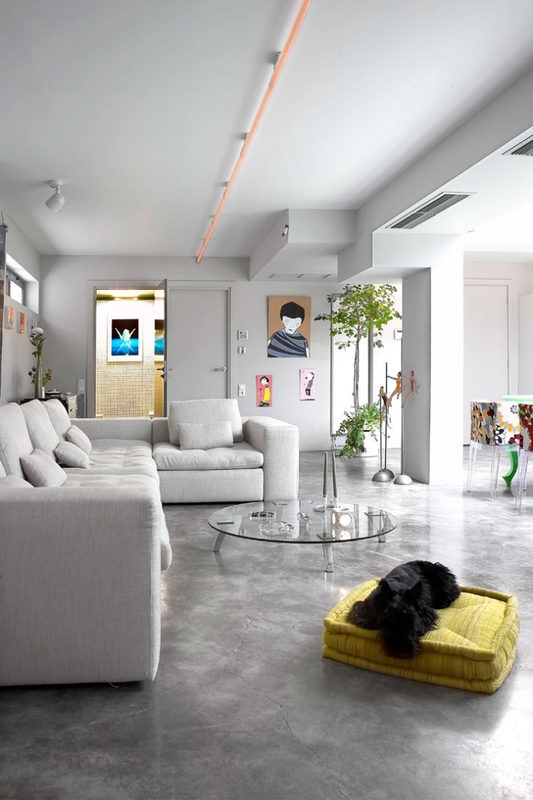 However, as the owner is also a very sociable man, he planned for a flexible guest area within the living room. Two beautiful mattresses, placed on top of each other in one corner of room, function as a casual sofa or can turn into a double bed for overnight guests while a thin curtain can discretely screen-off the area. Paintings and objets d'art by promising young artists are dotted around the flat. 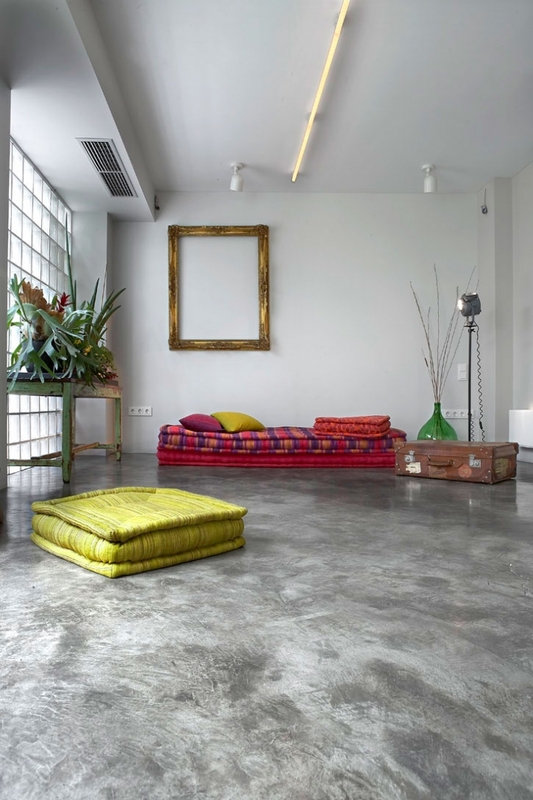 They come from M-art Space the gallery on Solonos Street in Kolonaki/Athens.GR, which is owned by Andreas and his sister Eugenia Manolioudaki, a jewellery designer. Apart from the galley space, M Art also designs and produces inventive corporate gifts, as well as hosting classes in drawing, sculpture and jewellery making for children aged five to twelve. The most recent addition to M Art is an art consultancy division. 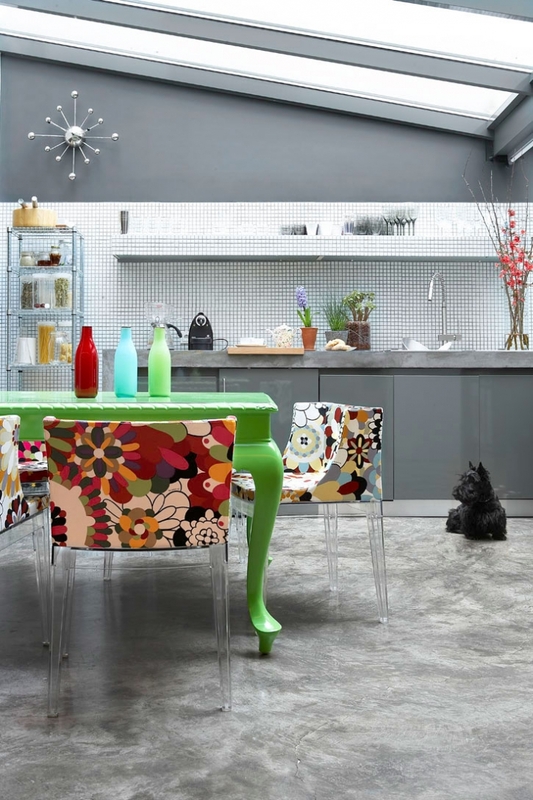 Apart from the art on the walls, which are decorated in two neutral shades, what really gives colour to the flat is its ‘hearth’: an old wooden table that’s been painted in a vibrant green lacquer and partnered with colourful Mademoiselle chairs by Philippe Stark for Kartell. 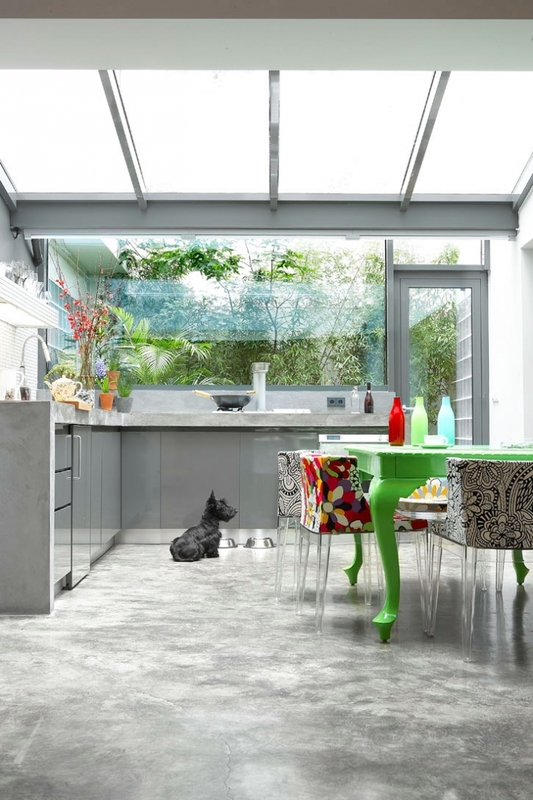 The concrete kitchen worktop was cast in-situ, designed to suit the space and accommodate all the necessary electrical appliances. Food staples such as herbs, spices and dry foods are kept on show, stored inside beautiful glass containers on a metal shelf unit from Ikea. There are no cupboards above the worktop; neither do any fixtures reach the ceiling. This is a deliberate move intended to maintain a flowing sense of space, “for the mind to wander” as Andreas says. The long uninterrupted runs of linear tungsten lamps also encourage this sense of interconnected space charting notional paths through the flat. A great deal of attention has been devoted to the lighting strategy. 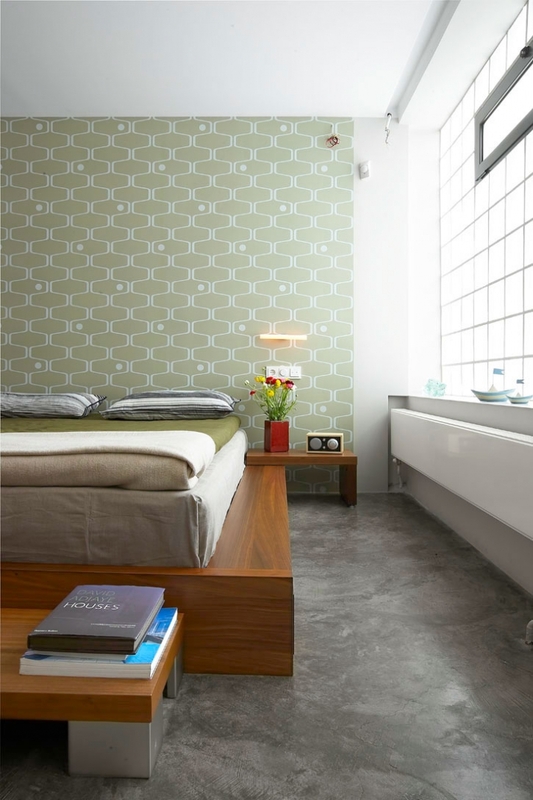 The wall behind the bed in the bedroom suite is covered in the iconic pattern of the carpet at the Royal Festival Hall in London and all the bespoke bookshelves and walk-in wardrobe units as well as the desk have been designed by the architect. The same goes for the bathroom of this writer’s dreams! 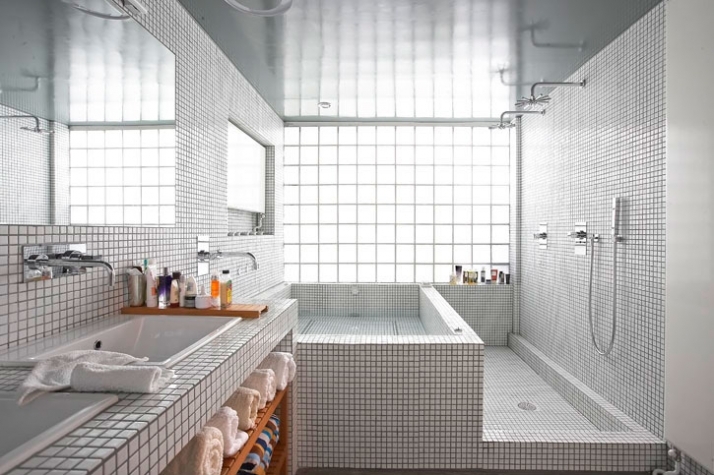 It’s a large comfortable space entirely covered in glass mosaic tiles, which reminds one of luxurious baths. It incorporates a generously proportioned Jacuzzi, two rain showers and a bench to relax on, as if in a Turkish bath. Antonis Skordilis of Greenways Landscape Architects, selected all plants to withstand the low lighting and high humidity in the flat. Every little detail in this home has been carefully considered and is fully attuned to its owners’ lifestyle.